A new dialysis unit is to be opened at Peterborough City Hospital by former Eastenders and Coronation Street actor Jimi Mistry and his wife Flavia Cacace, a professional dancer on Strictly Come Dancing. 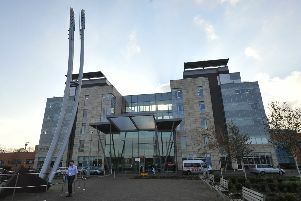 The couple will be joined by Dr Chandra Mistry - whom the unit is being named after - for the opening on Wednesday, April 26. The name was chosen in recognition of retired Dr Mistry, Jimi’s dad, who worked at the former Peterborough District Hospital for over 20 years and is an international pioneer in the world of dialysis. The new purpose-built unit opened its doors to its first patients in January and is run by North West Anglia NHS Foundation Trust in partnership with Leicester’s Hospitals. The unit is located adjacent to the city hospital, creating 10 additional dialysis stations, enabling more dialysis patients to receive treatment locally and preventing the need to travel to neighbouring hospitals. Members of the executive team from North West Anglia will be attending the opening alongside Leicester’s Hospitals’ non-executive director Colonel Ian Crowe and key members of the Leicester Renal Service.